Perhaps you have a girlfriend who is the love of your life. Maybe you’ve done or said something stupid that hurt her feelings. Now, you completely regret your thoughtless words and actions, but she’s still upset with you. How can you ever hope to express the depth of your regret and desire to make things right in your relationship again? Flowers and candy can come across as cliché and manipulative. 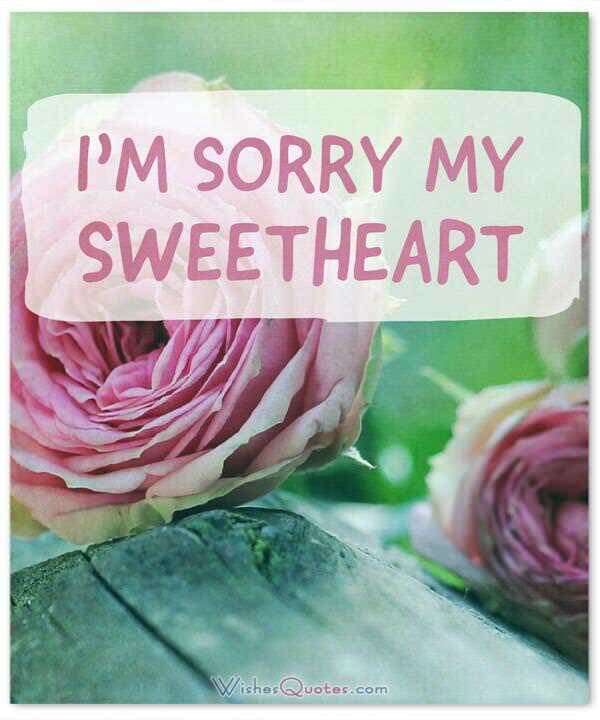 If you really want to have the opportunity to win back your girlfriend’s heart, expressing yourself clearly in a sincere apology could be the right move. Though actions speak louder than words, and she probably won’t believe your apology is sincere if you don’t follow through with changed behavior, making the apology is a good first step toward the restoration of your relationship and rebuilding of trust. So what are you waiting for? 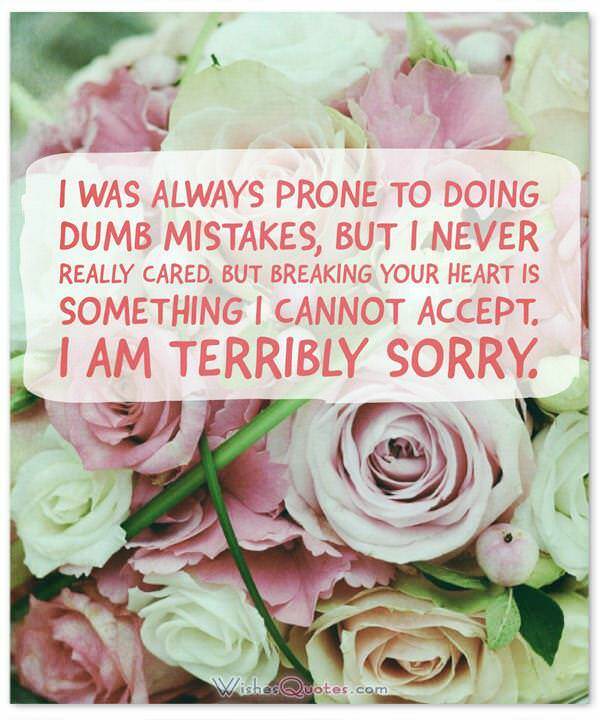 Here are some well-worded, heartfelt, and sensitive “I am sorry” messages you could consider sending to the lovely lady you’ve offended. I can’t believe what a fool I was to treat you the way I did. I hope you can find it in your heart to forgive me and allow me to show you the kind of love and respect you truly deserve. You deserve a man who will put your feelings and needs above his own. I haven’t been that man in the past, and for that, I am truly sorry. I was always prone to doing dumb mistakes, but I never really cared. But breaking your heart is something I cannot accept. I am terribly sorry. 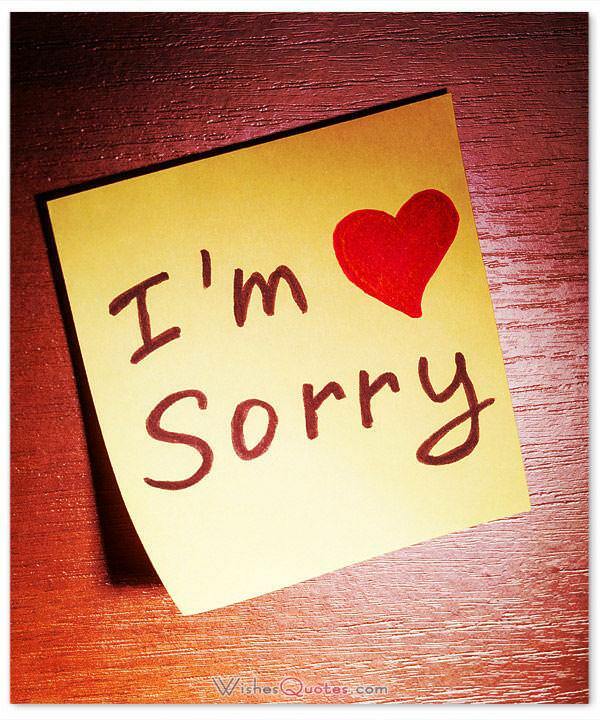 My apology to you is not because I just want you not to be mad at me. I completely understand that what have I done was stupid, and I’m fully prepared to do whatever it takes to get you to forgive me. I am sorry. No matter how many times you refuse to forgive me, I will keep trying. Because my love for you is something that cannot be easily forgotten. I have learned to accept all the mistakes I make, but when they hurt the most important person in my life, then that is something I cannot accept. I beg for forgiveness, I love you. I know that my actions have damaged the bond that the two of us share, but I am asking you to forgive me because I cannot live without you beside me. I am sorry. They say that everyone deserves a second chance. So I am begging you to give me one. I know that what I did was not right, but still, that is no reason for this beautiful bond we share to break like this. Please forgive me, I love you. When we first got together, we promised each other that will let nothing and nobody separate us. Yet, my actions have caused you to break that promise. I am begging you to forgive me, I love you and I am sorry. Being with you has been the best thing I have ever experienced in my life. I really do not want it to end like this. Please forgive me for my stupidity, I love you. I cannot believe that I managed to break the heart of such a beautiful creature like you. I am a giant fool for not being more careful of my words and actions. I am terribly sorry, I regret everything I’ve done. Please forgive me, I love you. I wish this was Men In Black, and I could just delete all the stupid things I’ve done from your memory. But since real life isn’t that easy. I can only tell you how much I love you and beg for forgiveness. I love you, I’m sorry. You have always been more mature than me, and you have this sense of forgiveness that always comes to play when I do stupid things. So I am begging you to forgive me one last time, I am terribly sorry for what I have done. I love you. Being separated from you is my version of living hell. I cannot stand your absence anymore. I am begging for forgiveness. Please return to me, I am sorry. I never intended to hurt you like this, I am terribly sorry, please forgive me. You are the sun of my life, and with you missing, I have grown afraid of the dark. This is not a cheap act I do to seek your forgiveness. I have truly repented for all the things I’ve done, and I want to say I am truly sorry and I love you more than you can ever imagine. If you choose to forgive me, then I promise I will be different, and make your life, no, our lives, better. I love you. No matter how big or small a lie it, it doesn’t stop being a lie. I am ashamed of what I’ve done, and I am begging you for forgiveness. 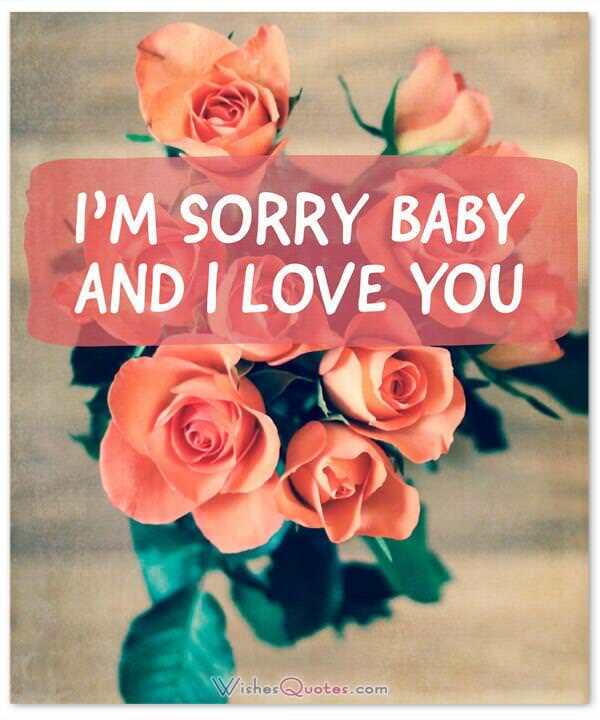 I love you, and I’m sorry. There are 2 limitless things in my life right now. My love for you and the sense of guilt and regret I am feeling after what I’ve done. Please forgive me, I love you. It’s been a long day without you, I cannot stand this feeling of loneliness, and it pains me to see you get hurt, especially when I am the one to blame. You truly are the woman of my life. I am terribly sorry. No matter how many distractions I try to give myself, your absence is something I cannot handle. My world is empty without you. Please forgive me and come back to my arms. I love you. Through all of my actions, I’ve only thought about you, and what was best for us. It’s harsh for me to see that something that started as an action for the best, ended up with the worst result possible. Please forgive me, I love you. We used to say that we loved the silence, the peace, and quiet. But when that silence includes your voice as well, then it is unbearable. Please forgive me, I love you. When we decided to get married, we both said “I do”, and promised to let nothing get in the way of our love. So why are you letting something of such small importance to separate us like this? 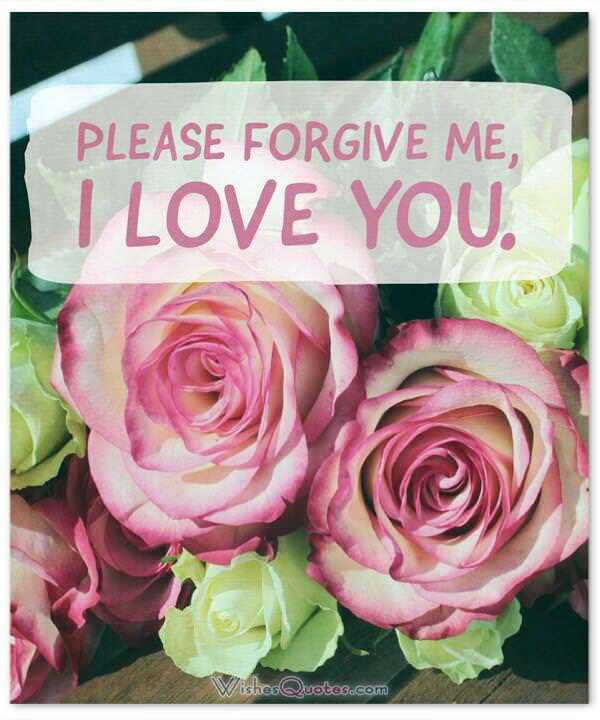 Please forgive me, I love you. You truly are the best thing you have happened in my life. I know that you do not deserve an idiot like, yet, I want to become selfish and ask you to forgive me and take me back. I love you. Ever since you left, I haven’t been able to take care of myself properly. I am in dire need of your presence to function. Please forgive me for what I’ve done and come back to me. I love you. Even though I’ve promised to make you happy, I’ve managed to do the exact opposite and broke your heart. You truly are the woman of my dreams, and I cannot afford to lose you like that. Please come back to me. I am sorry. Sweetheart, I’m turning over a new leaf. I am so sorry for the failure of a boyfriend I’ve been in the past. Please forgive me! I really messed up. I had the most beautiful relationship of my life and I threw it away for a pipedream. Now, I’ve come to my senses and realized how wrong I was. Please forgive me! Even though I don’t deserve it, would you ever be able to find it in your heart to forgive me? I want another chance to win your affections. Leaving you was the biggest mistake of my life. I miss everything about you. Is there any way you could find it in your heart to forgive me and take me back? Losing you has shown me how empty life is without you. I want to be with you again. I am so sorry for hurting you and pushing you away. Will you please forgive me? If I could go back in time and change the way I’ve treated you in the past, I would. I can’t, but I’d love a chance to show you how much I’ve changed in the future. Is there any way you could forgive me and give me that chance?